Great Kid Books: Welcome to Poetry Friday! Welcome to Poetry Friday, a weekly event hosted by the Kidlitosphere online community. Below you'll find a wonderful treasure of resources to share great poety with children. I also have a review of an inspirational poetic picture book, Our Children Can Soar. My review of this books follows. As we celebrate Martin Luther King, Jr. this weekend, I would like to highlight the inspirational book Our Children Can Soar: A Celebration of Rosa, Barack, and the Pioneers of Change. Thirteen leading African American artists collaborated to honor the achievements of African Americans, paying tribute to 10 individuals, including George Washington Carver, Ruby Bridges, and Jackie Robinson. These individual's accomplishments are shown linked together, in a way part of a seamless continuum building on one another. The illustrations are each in a different style, recognizing the unique work of each artist. For more on what it meant to the artists, see Jules' interviews at Seven Impossible Things. Our Children Can Soar is certainly striking for its illustrations (striking is an understatement - amazing, is more like it), but the poetic text also lends to its power. The simple patterned text is so effective because it repeats the central mantra that each of these figures did what they did so that their children could stand on their shoulders. As Doret wrote at The Happy Nappy Bookseller, "It takes the reader through the cumulative story of the US Civil Rights Movement, expanding the popular slogan beyond these three heroes to include more key players in the struggle for equality. Spare prose and vivid imagery make this a truly moving and accessible picture book to be savored by readers of all ages." You can find Our Children Can Soar at a local public library with WorldCat. I would love feedback to see if this link helps you find this at a library near you. It is also available in bookstores and Amazon. We have many new reviews and poems to share today. If you have a review, please leave a comment and link below or email me at greatkidbooks (at) gmail.com. I will update these throughout the day. Charles Ghigna shares an original poem, "A Poem Is A Metaphor" on his Father Goose blog. Bookie Woogie reviewed The Cuckoo's Haiku, and the Z-Kids were inspired to write some great bird haiku of their own. Greg has a new poem about "firsts" to share on Gotta Book inspired by the poetry stretch at The Miss Rumphius Effect. Susan Taylor Brown has a poem, "First Kiss", also inspired by the poetry stretch at The Miss Rumphius Effect. Carol shares a a Martin Luther King poem called "Standing Tall" by Jamie McKenzie. Laura Salas shares a poem by Mary Oliver called "The Swan." Playing by the Book shares a review of All Join In, a collection of poetry and illustrations by Quentin Blake. Mandy reviews a professional book, Playing with Poems, at Enjoy and Embrace Learning. At Random Noodling Diane Mayr remembers those who have died in Haiti with Dylan Thomas's "And Death Shall Have No Dominion." Kurious Kitty has a poem, "Pebble," from The Poetry of Our World: An International Anthology of Contemporary Poetry. At Write Time, Linda shares a poem by Lyn Lifshin called "The Other Fathers". Deo Writer shares an original poem about trembling firsts, also inspired by Tricia's poetry stretch. Sara at Read Write Believe has an entry is about keeping a commonplace book, which enables "wits with short memories" to keep poetry and other important things close. Karen Edmisten shares a poem by Jane Kenyon, "Briefly It Enters, Briefly Speaks". Jone at Check It Out: Life in a K5 Library School Setting celebrates William Stafford's birthday with one of her favorite poems: "The Trouble with Reading". Irene Latham celebratres her 500th post with "To a Skylark" by Percy Bysshe Shelley found on page 500 of the book she'd want with heron a deserted island: The Top 500 Poems, edited by William Harmon. Hearty congratulations for 500 posts! ShelfElf reminds us that hope matters so much, especially this week, sharing the poem "“Hope” is the thing with feathers" by Emily Dickinson. Jeannine Atkins writes about how Margarita Engle blends poetry and verse with her novels-in-verse. Brian Jung, aka Mr. Chompchomp, shares one of his favorite poems for January, "These" by William Carlos Williams, found on PoemHunter. As he writes, it seems especially fitting right now as we face "desolate, dark weeks / when nature in its barrenness / equals the stupidity of man"
Welcome to Kathy B at Forwords Books - this is her first Poetry Friday. She is recommending several books for for Tu B'Shevat, the Jewish birthday of the trees, including a Cybils finalist: The Tree That Time Built. At Becky's Book Reviews, Becky is sharing a speech from Julius Cesear by William Shakespeare from Manga Shakespeare's edition of Julius Caesar. At Wild Rose Reader, Elaine Magliaro shares "Mouse: An Original Acrostic Poem". Over at Blue Rose Girls, Elaine also also shares "Winter Dusk," by Walter de la Mare. At Bildungsroman, Little Willow has posted an Emily Dickinson poem: "The pedigree of honey." Tiel Aisha Ansari shares an original poem this week about Haiti. Over at The Miss Rumphius Effect, Tricia shares a poem by Stephen Edgar that she hasn't been able to get out of her mind: "Nocturnal"
Lisa in Little Rock shares a Joyce Sidman poem, "Spelling Bomb" from This is Just to Say; Poems of Apology and Forgiveness. At Here in the Bonny Glen, Melissa Wiley has a post about Rilke, with an excerpt of “The First Elegy,” from The Duino Elegies. At Writing and Ruminating, Kelly Fineman has written a post about Marmion by Sir Walter Scott. At Semicolon, Sherry has a poem called "Christ in the Universe" by Alice Meynell. Kelly Polark has a limerick and a word game to share. Miss Erin is sharing an original poem called "i see invisible magicians." At A Year of Reading, Mary Lee has sent a poem about making mistakes by Fleur Adcock. That's all, folks. Thanks so much for sharing great poetry. Please note: if you click on the Amazon links for the Cybils finalists, the Amazon Associate links will contribute a small percentage toward the Cybils organization. If you click on a link on my review, a small percentage will go toward Great Kid Books. Thanks, Mary Ann! Love your blog. Here's "A Poem Is A Metaphor"
Love to see those Cybils books.... (says one of the five final judges!). I'm up with a quick original this week, inspired by a prompt at the Miss Rumphius Effect. Like Greg, I'm in with an original poem inspired by a prompt at the Miss Rumphius Effect. Thanks for hosting. 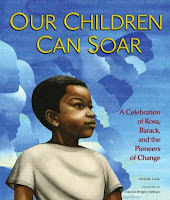 OUR CHILDREN CAN SOAR looks like a book I need to own. I'm in with a Martin Luther King poem by Jamie McKenzie (I think he is going to be one of my new favorite poets!). Thanks for hosting, Mary Ann. I'm in with a Mary Oliver poem called The Swan. http://www.playingbythebook.net/2010/01/15/making-a-racket/ - a review of All Join In by Quentin Blake. Thanks for hosting! This week I reviewed a professional book, Playing with Poetry. Thanks for hosting and guiding our sharing. Yes! Our Children Can Soar is a great choice. Thanks for the mention and thanks for hosting. I will definitely check out Our Children Can Soar, thanks for the review. At Random Noodling I remember those who have died in Haiti with Dylan Thomas's "And Death Shall Have No Dominion." Kurious Kitty has a poem, "Pebble," from The Poetry of Our World: An International Anthology of Contemporary Poetry.. It's a poetry stretch inspired poem. Thank you for hosting and featuring the Cybils Poetry finalists! My Poetry Friday entry is about keeping a commonplace book, which enables "wits with short memories" to keep poetry and other important things close. Thanks for hosting. I'm in with Jane Kenyon this week. It's here. Congrats Cybils finalists and thank you Cybils panelists. January always makes me think of this poem, but after both the desolation and stupidity of the last couple of days it seems especially poignant. Thanks for hosting -- and posting the Poetry Finalists. Marilyn Singers' "Wells" and Rusted Root's song "Send Me on My Way" came to me this morning as I try to process the horrible news from Haiti. This is my first time participating in Poetry Friday. I am thrilled to see that "The Tree that Time Built" is a Cybils finalist. It is one of the books I am recommending for Tu B'Shevat, the Jewish birthday of the trees, at http://forwordsbooks.com/bal-tashchit-do-not-be-wasteful/. I'm in with a speech from Julius Caesar by William Shakespeare. At Wild Rose Reader, i have an original mouse acrostic. At Blue Rose Girls, I have "Winter Dusk" by Walter de la Mare. I posted an Emily Dickinson poem here at Bildungsroman. I'm in today with the Stephen Edgar poem Nocturnal. I promptly put one of the Cybils books in my (eternally busy) shopping cart. Thanks for pointing us to them! I'm looking forward to perusing this week's Poetry Friday posts. Thanks for hosting, and for featuring the CYBILS finalists - what a lovely thing for you to do! Love the King portion of the post as well. I'm in with a post about Marmion by Sir Walter Scott. Here's the link: http://kellyrfineman.livejournal.com/518457.html. Congrats to the Poetry Cybils finalists!! Thank you for hosting, Mary Ann. I'd like to check out that book by Mary Ann Hoberman and LInda Winston, as Ms. Hoberman is one of my favorite children's poets. I love A House is a House for Me. I'm late joining in. I posted one from Emily Dickinson today. I'm really late, but I did write a review today of a book of poetry for kids. I figured I might as well mention it even though it's the end of the day! Play with your food? Play with your books! Have a Fresca! Let's toast Jon Scieszka!